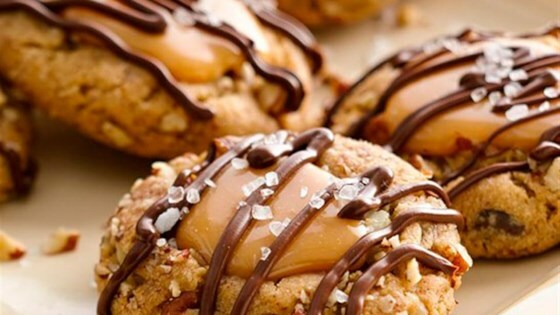 "Chocolate lovers won't be able to resist these caramel-topped cookies drizzled with melted chocolate." Heat oven to 350 degrees F. In large bowl, break up cookie dough. Stir or knead in flour until well blended. Shape tablespoonfuls of dough into balls; roll in pecans, pressing into dough. Place 1 inch apart on ungreased cookie sheets. Bake 12 to 16 minutes or until edges are light golden brown. Using handle of wooden spoon, make indentation in center of each cookie. Cool 1 minute; remove from cookie sheet to cooling racks. Cool completely, about 20 minutes. Meanwhile, in microwavable bowl, microwave caramels and half-and-half uncovered on High 1 to 2 minutes, stirring once, until caramels are melted. Spoon about 1 teaspoon caramel into indentation of each cookie. Cool 15 minutes. Drizzle with melted chocolate; sprinkle with salt. Let stand about 15 minutes or until chocolate is set.